In the fore-noon Trivedi Mewada Brahman Samaj organized Laghurudra and community group worshiping program out side the Ashram. Pujya Swamiji Maharaj graced and blessed the grand gathering and joined the community group worship. In the evening a special Shringar was adorn to Lord Shiva at Sri Viswanath Mahadev and Bhashma Aarati was performed by Revered Sri Swamiji Maharaj. Devotees in large numbers sat in front of the temple in grandly decorated Pandal. Vishvanath Temple was crowded with devotees and devotional music was presented through out the night by Dr. Jayant Vasavada’s group of Sri Hatkesh Swar Gunjan Mandal, Dr. Monica Shah of Aradhana Sangeet Academy, Pandit Niraj Parikh & Pandit Vikash Parikh & group. Next day morning on March 5, 2019 a grand mahaprasad was served to the thousands of devotees at the ashram. Holy pilgrimage of Sri Vaishnavo Devi & Amritsar (March 23, 2019 - March 26, 2019): A group of sixty-two devotees with Pujya Swami Adhyatmanadnaji Maharaj from the ashram paid homage to Sri Vaishnavo Devi shrine in Jammu Kashmir range. It was a treat for the devotees.They also paid homage to Holy Sri Durbar Saheb Golden Temple, Jaliwala Baugh, Shitala Mandir and Wagha Border. Yoga at Udhampur (March 29, 2019 -March 31, 2019): Pujya Sri Swamiji and his team of yoga teachers conducted capsule curse at H.Q. of Northern Command Udhampur. Elocution Competition: Annual Elocution Competition for the colleges of Gujarat University was organized. Fifteen colleges came forward for the competition. L. D. Engineering College was found the best. Dr. Niranjana Vohra & Dr. Prashant Dave were the Judges. H. H. Sri Swami Kamalanandaji Maharaj & H. H. Sri Swami Narayananandaji lit the lamp. Dr. Varsha Dave, a trustee of the ashram gave out award to the winners. Spot painting competition for primary & secondary school children was also organized on this occasion. Master Poojan N. Panchal of Seth C. N. Vidyalaya, Ms. Najiba Fatima Dhukka of Hiramani Primary School, Miss. Riddhi Patel of Sri K. N. Primary School were the winners. In middle school’s group Sri Dishit C. Shah, Miss Yesha N. Shah of the Divine Life School, Miss Forum Doshi of Little Flower Higher Secondary School were the winners. Professor Mr. Jay Pancholi & Mr. Prashant Patel were expert judges for the competition. Credit goes to Professor Chirag Pandya & Smt. Kadambini Pandya of Gujarat University for planning the entire program. All participants were awarded certificates. Also, food, prasad and Sivananda literature were gifted to all. March 1, 2019, to March 3, 2019 Government of India, Minister of Human Resource Mr. Prakash Jawadekar organized "Hackathone" program for continuous 36 hours in the field of research work done by young scientists and technocrats. About 12 different states of India, 380 candidates joined the program at Sivananda Ashram, Ahmedabad. In fact 42 cities, among 2 lacks entries and 11,000 research scholars were selected in this Hackathone program. Prime Minister of India Mr. Narendra Modi gave inaugural video conference speech. Mr. Prakash Jawdekar gave welcome speech. Minister of education Mr. Bhupendrasingh Chudasama from Government of Gujarat, Vice-Chancellor of Government Technology University and Director Space Research Institute ISRO, Ahmedabad graced the occasion. There were 38 teams were to solve the problem given to them regarding nations number of projects for number of States. Best winner team was awarded Rs. 1,00,000. Revered Sri Swami Adhyatmanandaji Maharaj was invited to grace the opening and closing sessions. Ahmedabad: On March 2, 2019, Revered Sri Swamiji Maharaj was invited for Sri Morari Bapu’s katha as well Shiv Puran Katha at Zydus ground. Revered Swamiji consecrated 35 ¼ inches high Shivlinga made of 1,25000 Rudraksha. Vastrapur (Ahmedabad) : On March 3, 2019 Pujya Sri Swamiji Maharaj was invited to car rally organized by Blind Man Association. Driver will be driving the car guided by blind man with the help of navigation through the "BRAIL" instructions. Revered Swamiji praised and motivated to all participants and organizers. Haridwar (March 7, 2019): Bharat Mata Yanja was organized by H. H. Sri Swami Satyamitranandaji Maharaj. Revered Sri Swami Adhyatmanandaji Maharaj graced the inaugural session. 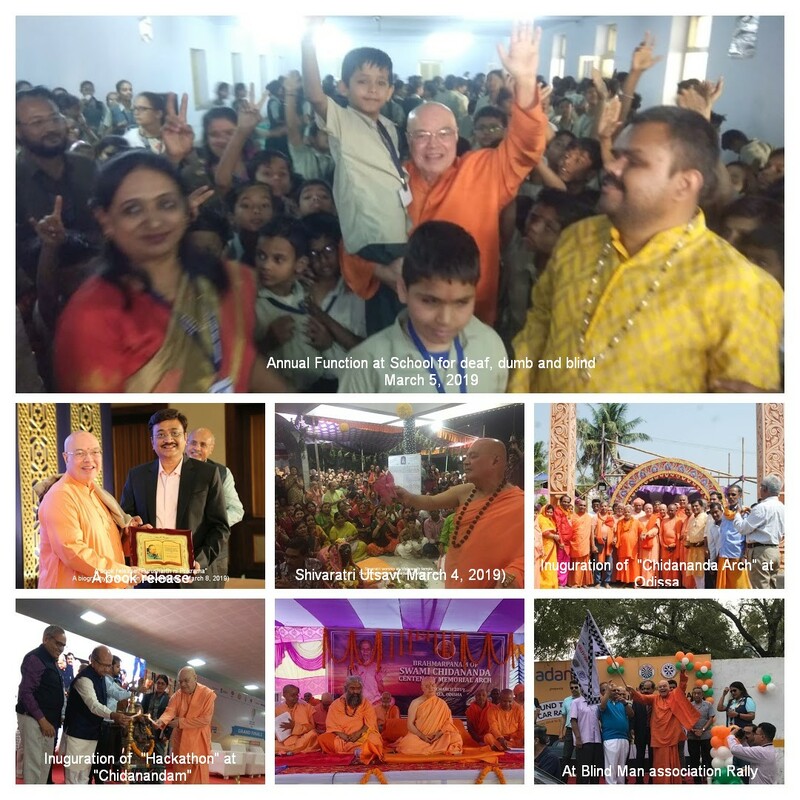 Swamiji returned back to Ahmedabad the next day on March 8, 2019. On March 9, 2019 Pujya Swamiji Maharaj attended a book release function of Mr. John Geevergeese. Book “Purushartha Ni Parikrama” by Kinjal Oza Vaidya is a story of struggle for perfection. Haridwar (March 10, 2019) A grand gathering of Saints and Sages was organized. The subject of the meeting was Unity of Nation. "Love India", India first, society next and self is last or least. Revered Sri Swami Maharaj said that look back even birds, animals, children also have shown their loyalty and patriotism towards the nation. Never say I am Gujarati or Marathi, say I am Indian. We belong to this great land of Himalaya, Ganga, Sages, Saints, Gita, Rama and Krishna. Feel proud to be born in Bharat, stay united and strengthen the power of Mother India. Ahmedabad (March 3, 2019): Rotary Club Ahmedabad Metro organized Artificial Limbs Donation Program at Sivananda Ashram, Ahmedabad. About 153 Handicaps people from all over India, Dubai & Bangladesh were served with love. Thanks to Smt. Jyoti Daftari, President and Sri Atul Parikh, Secretary of Rotary Club Ahmedabad Metro for choosing the ashram as venue for this noble cause. Berhampur, Odissa (March 11, 2019): Worshipful Swamini Divyaswarupananda Mataji of Sivananda Ashram, Kendra Pada and H. H. Sri Swami Brahmanishthanandaji Maharaj from Sri Jagannath Puri received Revered Sri Swamiji Maharaj and after lunch they went to Berhampur. Evening satsang was organized at Sri Vishnu Temple and next morning Simhala Village. "Chidananda Marg" and "Swami Chidananda Memorial Arch"was inaugurated by Revered Sri Swami Adhyatmanandaji Maharaj. On March 13, 2019, after having darshan of Sri Sri Sri Lord Jagannath, Swamiji Maharaj travelled Bhubaneswar, Kolkata, and Agartala. Agartala (March 13, 2019): At Agartala Sri Sri Sri Ma Anandamayi ashram, Sri Sri Sri Ma, Sri Didi Ma, Babu Bholanathji and Goddess Saraswati's idols were installed. Sri Swamiji stayed here and at Sri Jagannath Temple for celebration of "Daul Purnima", Holi and Happy Birthday of Sri Sri Lord Chaitanya Mahaprabhu. Kheora, Bangladesh (March 17, 2019) : On early morning Sri Swamiji Maharaj had a quick visit to Bangladesh. Sri Swamiji visited ashram and temples at Kheora. On March 18, 2019, Sri Swamiji arrived back to Ahmedabad.